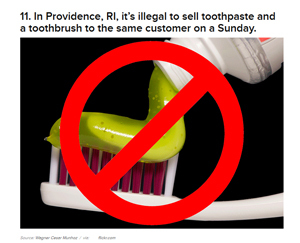 "In Providence, R.I., it's illegal to sell toothpaste and a toothbrush to the same customer on a Sunday." By C. Eugene Emery Jr. on Thursday, July 25th, 2013 at 12:01 a.m.
Screen capture taken July 19, 2013 of BuzzFeed claim about toothbrush-toothpaste sales ban in Providence, R.I.
Hey fans of Rhode Island trivia! Did you know that in the capital city of Providence "it's illegal to sell toothpaste and a toothbrush to the same customer on a Sunday"? But that's what we were told in a July 14 feature titled "11 Awesome Facts You Never Knew About Rhode Island," listed on the popular news and entertainment website BuzzFeed. Here at PolitiFact, we had two questions. First: Is that really true? Second: Who thinks the inability to buy a toothbrush and toothpaste together on a Sunday is awesome? For the uninitiated, BuzzFeed, which regards itself as a legitimate news website, is always trying to take a hot topic and make it hotter. BuzzFeed loves lists. Its July 19, 2013 home page featured "The 33 Fluffiest Animals On The Planet," "38 Things Catholic Girls Love" (#7 is "Pancakes." No explanation is offered), and "14 Not-At-All Gratuitous Breast Ads (Note to BuzzFeed: They ARE gratuitous)." We decided to focus on the toothbrush claim because we don't want Providence residents to be at a disadvantage when it comes to dental hygiene. We emailed BuzzFeed and asked for its source. We also checked Rhode Island law to see if there was a toothpaste-toothbrush statute that applied to Providence (or any community). We came up with nothing. We also checked the online version of Providence's city ordinances. We found nada. Then we called Providence City Hall and spoke to Deputy City Clerk Lori Hagen, who indulged us and did her own check. She found zip. The ordinances don't contain any derivative of the word "tooth." If it existed, "it would be in the code of ordinances," Hagen said, adding that she's never heard of any such restriction. She's worked for the city for 24 years. We thought it might be an old ordinance, repealed long ago. City Archivist Paul Campbell came up with bupkis. Mellon said, "There's multiple accredited sources that have written about it, including the Brown Daily Herald and the Telegraph" in Australia. The unnamed blogger for the Herald, Brown University's student newspaper, reported buying both items at a local CVS, insisted that the prohibition was real, and treated the purchase like an act of civil disobedience. The blogger's source turned out to be a list at DumbLaws.com, which cites no actual law, past or present. At least the Telegraph story begins: "Here is a list of the world's most ridiculous laws or urban myths - we’re not quite sure." BuzzFeed's Mellon ended her email by saying, "It seems like it's a commonly referenced piece of information." She should have added, "Which nobody ever checks." So oral hygiene fans can breathe a minty-fresh sigh of relief. A toothbrush and toothpaste can legally be purchased together any Sunday in Providence. Maybe someday this PolitiFact item will be part of a BuzzFeed list titled "217 Examples of How BuzzFeed Didn't Check Its Facts." It'll be a hot one because we give the website a Pants on Fire! Published: Thursday, July 25th, 2013 at 12:01 a.m.